mathleague.org is pleased to announce that it will be hosting the fifth annual national championship for elementary students on June 16, 2018 in College Station, Texas. We have implemented some exciting changes that will make this year's national championship the best yet! The contest will be held at Texas A&M University. A campus map is available here. Please see below for information about all aspects of the contest. If you need to contact us with questions that are not addressed on this page, you may email us at mathleague@mathleague.org. Our awards banquet will include a plated dinner, eliminating the buffet lines that slowed things down so much last year. 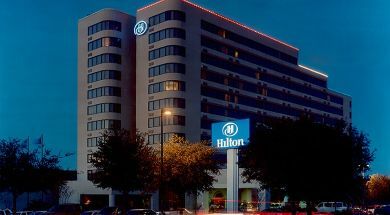 We have arranged a special deal at the Hilton in College Station, which will be our headquarters hotel. Check-in Friday night will be at the Hilton so that participants don't have to arrange a separate trip to the Texas A&M campus on Friday. We are redesigning the awards for the national championship so they will have a different look from the awards we give out at our other contests. Each student will receive their own check-in packet and results packet instead of giving one envelope per school. The results packets will include a copy of the solutions for each student. We have a new conduct policy in effect for all events starting with this year's state championships. Details can be found here. This document makes explicit some common sense rules that most of you are adhering to anyway but also includes procedures to protect your rights and guarantee due process in the event of a dispute between you and a proctor about a suspected rule violation. Our t-shirts will obviously have a new design this year incorporating our new logo, but as always they will include information about the event and a list of all qualifying schools. Well, this one isn't new, but as always we plan to display a picture slideshow on the projector prior to the formal start of the banquet. If you have pictures from contests this year that you would be willing to share, please email them to us at mathleague@mathleague.org. In each state where mathleague.org held a state championship in 2018, certain high-scoring students are qualified to participate in the national championship; details for how to qualify can be found here. Registration for this contest is only open to students who qualify or who are selected off the waiting list to replace qualified students who are unable to attend. To ensure a seat at the contest, qualified students must register by May 21; after May 21, if space is available, students will be invited from the waiting list to replace qualified students who have not yet registered. To join the waiting list, please send an email to operations@mathleague.org indicating which students from your school would like to attend the contest if space is available. The contest fee will be $20 per student, and students must pre-register for the contest by clicking the link below. To see a list of students from your state who have qualified for nationals, go to our results page, select your state championship from the drop-down menu, and click the "qualifiers to next level" link. Contact us at the email address at the top of this page if your school had two or more students at the state meet in the same grade with the same initials and you need help determining which student(s) qualified for nationals. Also be sure to let us know if you find any mistakes in the list so we can make sure everyone who qualified for nationals shows up on the list of qualifiers. Every school that registers for the contest must be accompanied by one or more adult sponsors who are willing to help proctor or grade tests (one sponsor should be designated on the registration form). Click below to register for this contest. Note: Registration deadline for qualifiers is May 21. After May 21, additional participants will be accepted only if space is available. Participants are responsible for arranging their own transportation to the venue. If you are flying, you should plan to fly no later than June 15 and leave no earlier than June 17. The closest major airports are Houston Hobby (HOU) and Bush Intercontinental (IAH) in Houston, and Austin-Bergstrom International (AUS) in Austin. All these airports have on-site car rental facilities, which is the recommended method for getting to College Station. There is an airport in College Station, but access is limited and prices are expensive, so participants are encouraged to fly into Austin or Houston instead. However, if you have airline miles you can use to fly to nationals, you may find that your miles will get you to CLL for the same price as to one of the major airports. If you are driving to campus, parking is available at the Cain Parking Garage right next to the Memorial Student Center. It may be possible to arrange ground transportation to College Station without renting a car; feel free to check out this link if you want to be adventurous! The College Station Hilton is the official headquarters hotel for the 2018 mathleague.org Elementary National Championship. Check-in will take place at the Hilton on Friday evening, and all mathleague.org staff will be staying at the Hilton as well. Most importantly, we have negotiated a $99 nightly room rate for our participants (a substantial discount from the normal $179 nightly room rate). To take advantage of this special offer, go to our event page to make your reservation, or book using the group code MATH18. All guests are responsible for their own reservations. There are a limited number of available rooms and this discounted rate is only available to guests who register before May 22nd, so please make your reservations as soon as possible. If you are unable to stay at the Hilton, you may find alternate lodging that meets your needs at the following link: Hotels near Memorial Student Center. Testing will consist of Number Sense, Target, Sprint, and Team rounds. Registration fee is $20 per student, and your confirmation email will indicate how to make payment for the contest. Participants are expected to bring their own pencils and calculators. Coaches are asked to check in and pick up student ID labels Friday night if possible to avoid delays on the day of the contest. Details regarding the Friday check-in will be emailed to participating schools the week of the contest. Testing will be in the Bethancourt Ballroom; participants may begin arriving at 9:20am on June 16 and should be seated by 9:50am. Testing will start at 10:00am and should conclude by 12:30pm. Students may then have the afternoon free for lunch and sightseeing on their own. Information about recommended activities will be included in the registration packets. If your students cannot test in the designated test center at the designated time for religious or health reasons, please contact us for more information about how we can accommodate the affected students. Prizes will be given to the top ten students in each grade level, as well as to the top five teams in each division, and will be handed out at an awards banquet on the evening of June 16. The awards banquet will run from 7:00pm to 9:00pm, with doors opening at 6:30pm. The banquet will be held in the same room as the testing (Bethancourt Ballroom). Tickets to the banquet will be $35 per person and will be on sale until May 21. After May 21, additional banquet tickets will only be sold if space is available. Every person attending the banquet (student, parent, coach, sibling, everyone) will require a ticket. We will offer standard, vegetarian, vegan, and halal meals; be sure to select the correct type of meal when you register for the banquet. Attendees who require a Kosher meal should contact us to arrange a plan if the vegetarian or vegan meal will not be adequate. We are unable to guarantee an allergen-free preparation environment, so participants with severe allergies (or any dietary requirements not covered in the options above) may wish to consider bringing food of their own. Please note that every banquet attendee is required to have a ticket regardless of whether they plan to eat the food served at the venue. You can register and pay for the banquet by clicking the button below. Practice tests are available for purchase at the mathleague.org store if you would like to prepare for the contest (one set of tests is available for free download on our site as well). For schools that did not get a copy of the state meet questions and would like to review those to practice for nationals, please send us your mailing address in an email once you have registered for the contest and we will mail a copy of the questions to you. Want to order a t-shirt for this year's national championship? We'll be selling shirts with the mathleague.org logo on the front and information about the national championship on the back. To order shirts, simply fill out the order form and submit payment by May 21. For each shirt, specify the quantity and size. All shirts are $12 regardless of size. A limited number of shirts may be available for purchase on site for $15, but we cannot guarantee availability of any particular sizes. We will also be selling this years book of tests (sets 11820 to 11828) at the contest for a discounted rate of $30. You can use the link below to pre-order these books. Congratulations to everyone who qualified for this event; we look forward to seeing you on June 16!